40 • May 2018 www.concreteproducts.com FEATURE TRUCKS & COMPONENTS With a World of Concrete 2018 backdrop, International Truck announced three plans to deliver on its Uptime pledge to vocational truck customers, each tied to the 12.4L big bore power package. "The International A26 engine, developed from a new way of thinking and with 'uptime' in its DNA, is at the core of our voca- tional truck strategy," said Vice President, Vocational Truck Business Mark Stasell. "We are so confident in the engine that we are offer- ing customers additional peace of mind through the A26 Customer Uptime Assurance Program, Vocational Confidence Warranty Package and International A26 Barrel Protection Plan. These are designed to protect our customer's investment and bottom line." A26 Customer Uptime Assurance is straightforward: If a truck owner experiences a warrantable failure on an International A26 within the engine's two-year standard warranty period—and down- time greater than 48 hours from the time of diagnosis—International Truck will provide a $250 Advantage Card, good for future parts and service purchases at an International dealership. Customers may be eligible for a maximum of eight cards per vehicle over the two-year period, a value of as much as $2,000 per vehicle. The program was introduced last year on the International LT and RH Series and is now extended to A26-powered HX and HV Series trucks enrolled in the OnCommand Link program. Vocational Confidence offers comprehensive powertrain coverage for HX and HV Series with A26 power. The four-year, 100,000-mile warranty offers complete powertrain and drivetrain coverage, includ- ing engine, transmission and axles. Coverage includes select Dana, Eaton, and Meritor components to provide customers added peace of mind. The program applies to orders for HX Series and HV Series trucks placed before June 30. Barrel Protection Plan: If a ready mixed producer experiences an A26 warrantable failure resulting in barrel damage, International will cover repair for the truck's first four years in service. Plan applies at no additional cost to provide customer assurance for concrete mixer trucks powered by the International A26 engine and equipped with OnCommand Link remote diagnostics technology. Warranty covers the expense of removing hardened concrete or replacing the concrete barrel if an engine related warrantable failure disables the truck so a loaded barrel cannot turn. 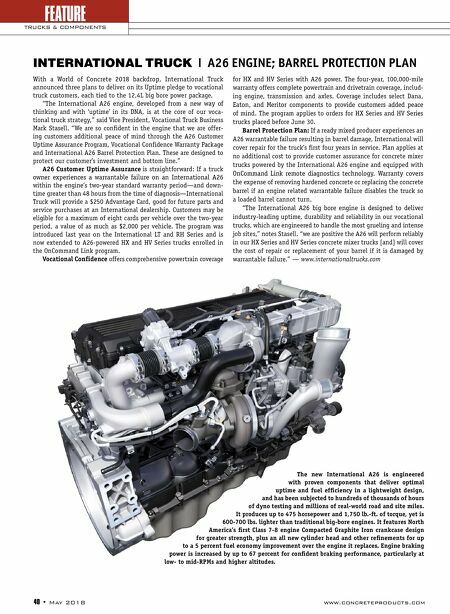 "The International A26 big bore engine is designed to deliver industry-leading uptime, durability and reliability in our vocational trucks, which are engineered to handle the most grueling and intense job sites," notes Stasell. 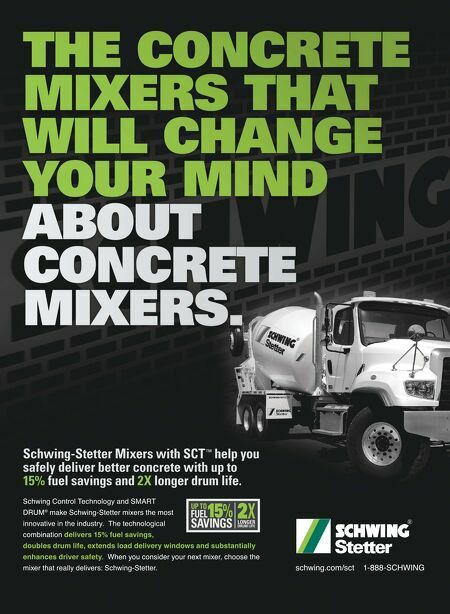 "we are positive the A26 will perform reliably in our HX Series and HV Series concrete mixer trucks [and] will cover the cost of repair or replacement of your barrel if it is damaged by warrantable failure." — www.internationaltrucks.com INTERNATIONAL TRUCK | A26 ENGINE; BARREL PROTECTION PLAN The new International A26 is engineered with proven components that deliver optimal uptime and fuel efficiency in a lightweight design, and has been subjected to hundreds of thousands of hours of dyno testing and millions of real-world road and site miles. It produces up to 475 horsepower and 1,750 lb.-ft. of torque, yet is 600-700 lbs. lighter than traditional big-bore engines. It features North America's first Class 7-8 engine Compacted Graphite Iron crankcase design for greater strength, plus an all new cylinder head and other refinements for up to a 5 percent fuel economy improvement over the engine it replaces. Engine braking power is increased by up to 67 percent for confident braking performance, particularly at low- to mid-RPMs and higher altitudes.